Following long preparations, Tim Coronel today presented the first electric Dakar Buggy in spectacular fashion to press and business associates. 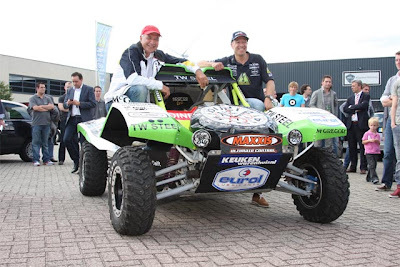 In the premises of partner All Green Vehicles (AGV) in Oosterhout,Coronel unveiled the prototype version of the electric McRae 4×2 Buggy, thereby providing a world first. The Netherlands’ first astronaut, Wubbo Ockels, drove the first few metres in the electric Dakar Buggy and Glennis Grace opened the afternoon with a spectacular performance. significant role in the project’s success (or failure). To this end the different working groups have drawn up a comprehensive testing programme which will be carried out in countries such as the Netherlands, France, Spain and Morocco. The definitive version of the electric Dakar Buggy will be designed on the basis of this test data.